Get Flash 8 to view enhanced content. Fresh, friendly, fun. Find it at Noriega Teriyaki House. Join our Google Groups mailing list to receive news and special offers. See our menus for lunch, dinner and party trays. View a short slideshow of our restaurant and food. Corporate lunch? Swanky party? 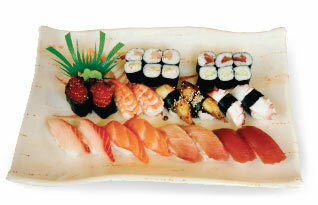 Order our delectable sushi/sashimi party trays. Check this space periodically for special discounts.